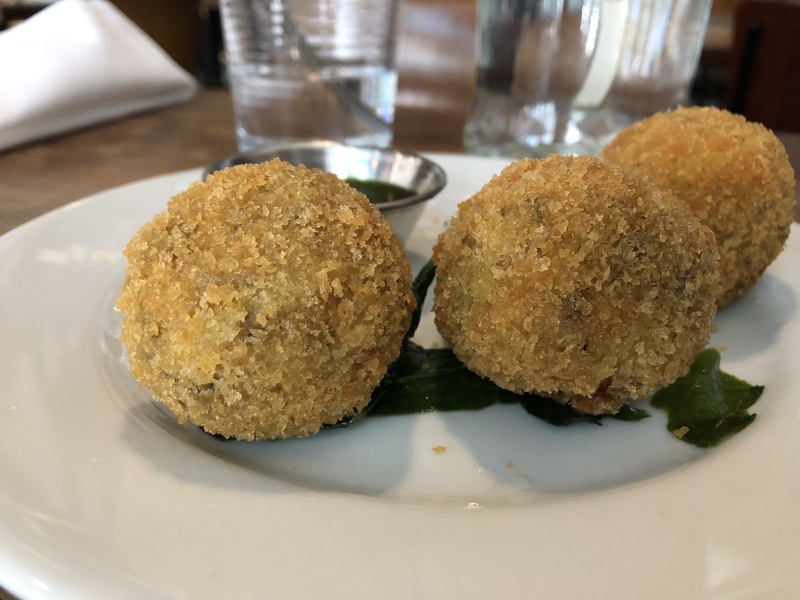 Kaya, helmed by Kingston 11 chef Nigel Jones, opened in 2018 and is a partnership with Daniel Patterson, who previously occupied Alta at the same location (RIP smoked bialys). On a weekend at 11am, with no competition from the weekday tech crowd, the “Jamaican Food & Rum Bar” was an easy walk-in. I’m interested to hear other’s thoughts on dinner and drinks. 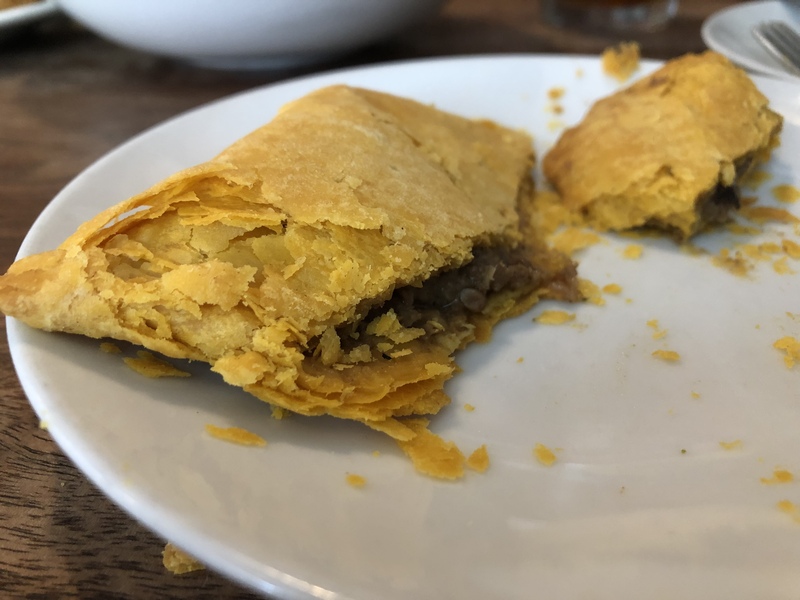 Jamaican patty, with beef, had a meaty oniony backdrop and a bold set of seasonings, not overly assertive on the spice heat but the flavors had good staying power. The smooth filling was embedded in a flaky, yellow-hued crust, presumably butter-based. I’d like to do a side-by-side with the ones at Peaches Patties Jamaican Kitchen in Bernal, an affiliate of La Cocina (i.e., SFBA’s culinary Marvel Universe), which I recall being equally good, but with an even heavier spicing. Salt fish fritters were more nuanced than homogenous-centered Spanish/Portuguese versions I’ve had. Kaya’s had identifiable fish and potato chunks, cemented together into a solid mass, and breaded in a way that I experienced waves of crunch. The chimichurri brightened an already vibrantly flavored dish. 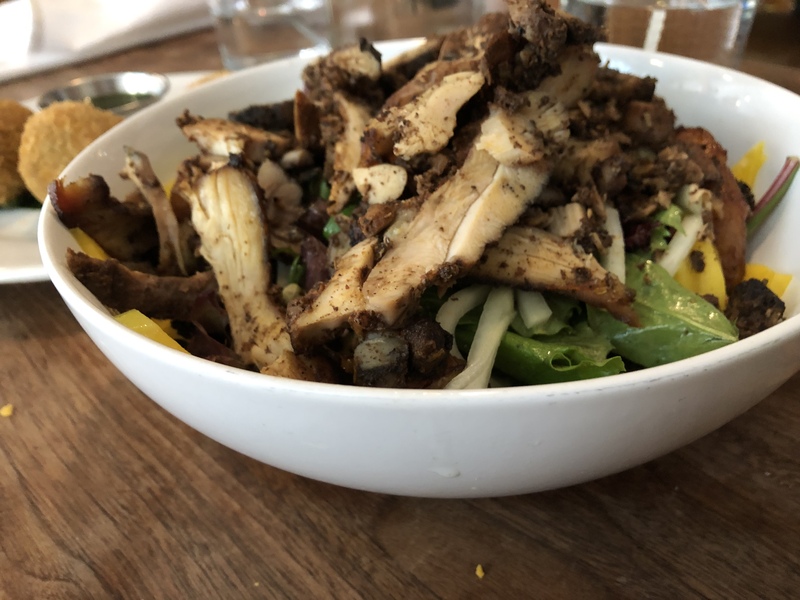 Jerk chicken salad had a good mix of flavors and textures-- mango, plantains, and mixed greens. The chicken, fragrant mostly from cloves, had some dry bits that didn’t matter too much embedded in a forkful of other stuff. Opentable is showing plenty of open spaces for brunch reservations, even for large groups, in upcoming weeks. It’s ridiculous that a place so good, of an underrepresented style of food, and close to BART is empty as people across the city queue up for pancakes and benedicts they could cook themselves if they weren’t hungover. On that note, the Cinnamon French Toast looked pretty good and the Asian Art Museum, Civic Center Playground, Sunday Civic Center farmer’s market, and Bi-Rite Kiosk are nearby. I’m going to have to check it out, but not used to thinking about traveling ( through East Bay) to SF for Caribbean. OTOH, we DO travel to Florida for Caribbean! What’s good in the east bay? And have you had a chance to try the chef’s east bay restaurant, Kingston 11, and if so what did you think? Can’t say I have much recent personal experience, although I have some “bookmarks.”, and we’ve tried some in years past. . That’s why I immediately ETA we end up saving our Caribbean exploits for back east. Will probably get to Kingston 11 first, if the patties are as good as THOSE look. Texting Kingston 11 to husband right now! When we return from back east we have a separate suit case for the patties. But not feeling potatoes in salt fish cakes. My in laws seem to think potatoes are… foreign. Kingston is excellent. Those salt cod fritters look more spherical than the ones at Kingston, but your report of the chunky texture sounds similar to what we had. We tried the goat curry - good curry, not much goat. Winner was the oxtails with the white beans, which was terrific. Best of all was the rum cake with rum raisin ice cream. OMG, a match made in boozy heaven!